Nanny’s BEST Banana Bread is a lovely soft, moist cake and absolutely delicious with the glaze poured over! A nice, easy recipe and freezer friendly too! Nanny loves to bake, and here, Nanny has kindly shared her super easy peasy Banana Bread recipe along with one of her favourite glazes. 1. Preheat oven to 350 F and grease a bundt pan. 2. In a separate bowl, sieve the flour together with the salt and baking soda. Set aside. 3. Mash bananas in a mixing bowl then add oil, then Eggs, then Sugar, and mix well, and then add a little at a time, the flour mixture, stirring so it is combined well. This photo below shows the addition of macadamia nuts. You choose whichever nuts you prefer, or leave them out completely. Whichever suits you! 4. Transfer the batter to your baking pan (if using a loaf pan, don’t forget this makes 2) and cook for 40 – 45 minutes or until toothpick comes out clean. 5. Allow to cool for 5-10 minutes then turn out on cooling racks and let cool completely before you add the glaze. 6. To make the glaze, melt the butter then add the remaining glaze ingredients to the bowl and stir until all combined. Place some parchment or a plate under the bread to catch the drips, then drizzle the glaze all over the cooled bread. 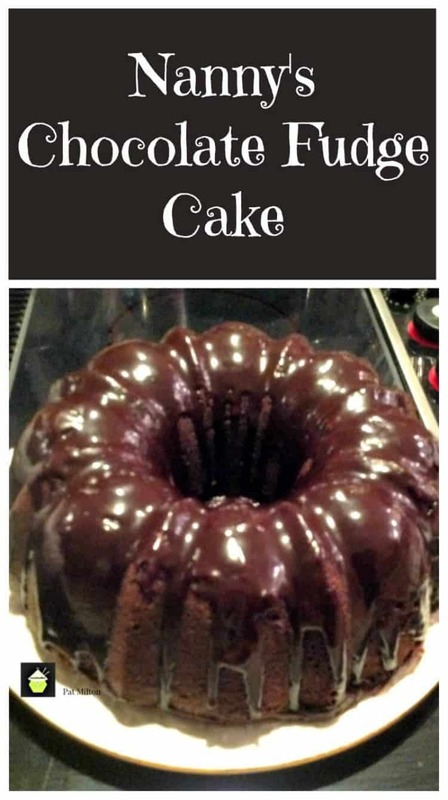 Looking for a good quality, non stick Bundt Pan to make Nanny’s delicious cake? Here’s one we can recommend. This bread freezes very well so you could cut into slices and freeze or make up a batch and freeze whole. Papa enjoys this bread when it is still warm, either cold or warm is nice but don’t forget, the glaze should be added once the bread has completely cooled. 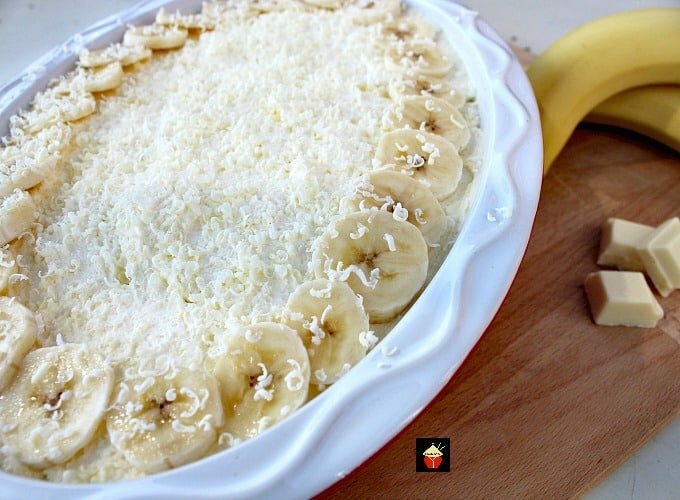 If you happen to have a few slices of Nanny’s best banana bread left over, make our delicious Banana Cream Cake Trifle. It’s quick, easy and soooo good! 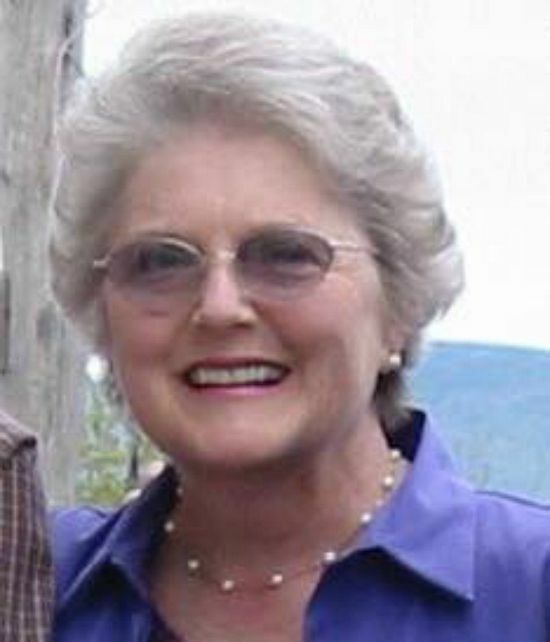 We’d love to hear from you and what you thought of Nanny’s Best Banana Bread recipe. Did you make any changes or add some other goodies? Let us know in the comments below. Thanks for reading and happy cooking! In a separate bowl, seive the flour together with the salt and baking soda. Set aside. 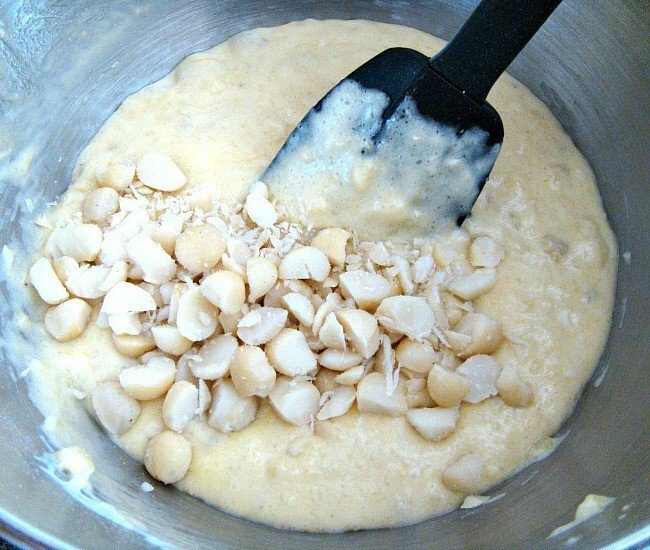 Mash bananas in a mixing bowl then add oil, then Eggs, then Sugar, and mix well, and then add a little at a time, the flour mixture, stirring so it is combined well. Transfer the batter to your baking pan (if using loaf pan, don't forget this makes 2) and cook for 40 - 45 minutes or until toothpick comes out clean. Allow to cool for 5-10 minutes then turn out on cooling racks and let cool completely before you add the glaze. To make the glaze, melt the butter then add the remaining glaze ingredients to the bowl and stir until all combined. Place some parchment or a plate under the bread to catch the drips, then drizzle the glaze all over the cooled bread. Just made this banana cake and it turned out great! Thank you for such an easy recipe. I added the toasted walnuts and some mini chocolate chips. Mine came out much darker because I used half dark brown sugar since I only had 1cup of white and only used 3/4 cup of oil. Baked it in a bunt pan at 325* convection for 50 minutes. The hard part was waiting a half hour for it to cool! It is so moist and delicious, thank you again! Is this AP flour or self rising flour? Hi Lynn, it’s AP Flour. Please enjoy! It’s delicious! after baking several cakes as per the recipe, all turned out great. I decided to try adding spiced apples,cream cheese and vanilla flavoring. The results were awesome. The cake was gone in a few minutes. I have baked this several times since, with the same results. I increased the baking time to one hour. It is very important to allow the cake to cool completely before removing from the pan. 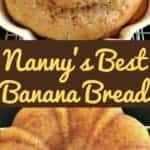 This banana bread is the best ever, I’ve been cooking for 50 years and always looking for a good banana bread recipe well I’ve finally found it! Thank you so much for sharing! I make lots of it for gifts at Christmas I’m so excited to share it this year! Awesome recipe, made it twice and everyone loved it, I have read all the comments after I made it and may cut back the sugar if it doesn’t affect the taste! Thank you for sharing! I used 1 1/4 cup sugar. Two cups would have been way too sweet. 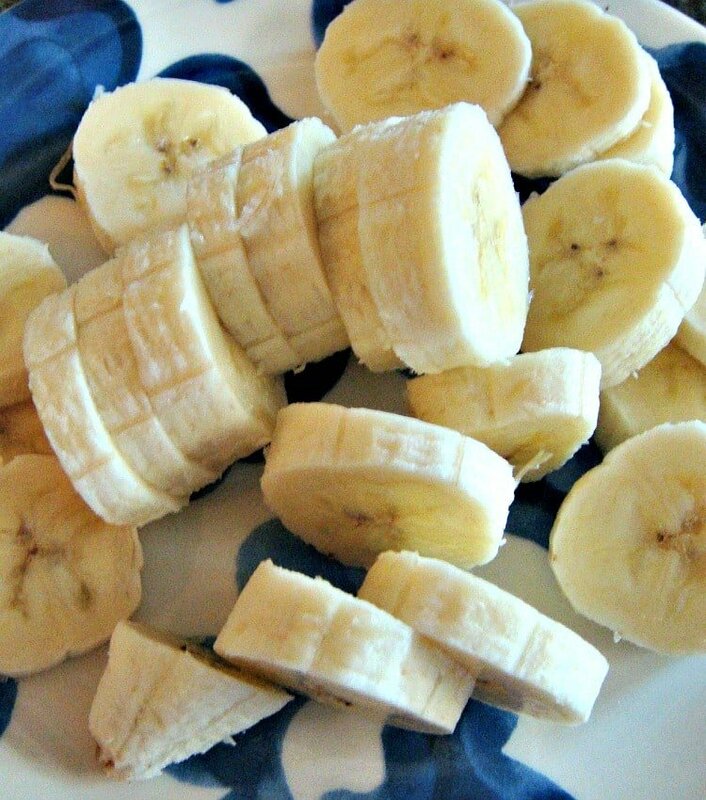 I think 1 cup would be fine since the bananas I use are always very ripe. I put a small portion of the batter with chocolate chips in two mini IKEA pans. The rest of the batter I added toasted walnuts and put it in a bundt pan. The cakes are very moist and have a crunchy outside. Delicious! I halted the recipe (I used two medium bananas and two large eggs) added macadamia nuts, vanilla, and cinnamon, extended the baking time ( for one loaf pan) and omg. My family wouldn’t stay out of the kitchen WHILE IT WAS STILL BAKING. I skipped the glaze and paired it with homemade strawberry jam and wow. Out of this world. Great base recipe, yields great texture. Thanks! Thanks so much for sharing this one… DELISH!!!!! I did add chocolate chips, pecans and walnut…. oh and a tsp of vanilla – did it without even realizing it wasn’t on the recipe….. AWESOME actually made it last weekend and I just made another one 15 minutes ago…. sure smells good in here…. Thanks again. Just made this today since I have two very riped bananas. I used only 1 cup of sugar since I will be adding sweetened coconut flakes and dark chocolate chips. I also added vanilla extract and pecans. Baked for 60 minutes on a bundt pan and it was delicious! I was planning to take it to work but the family ate half already. Guess I have to make another. I have tried several banana bread recipes that uses butter and it all came out too dense and hard. Glad to have found this recipe and thank you for sharing. It won’t let me rate but recipe is 5 stars! I only had 2 bananas so I halved the recipe and put it in a loaf pan. How much time would you recommend for a loaf pan? Hi Christina, if it’s half the recipe and a loaf pan, start off by checking after half the cook time and take it from there. I haven’t baked using have the quantity so I can’t say exactly how long it needs to bake for. I made this cake two days ago and we loved it!! I added a tablespoon of cinnamon to the batter and used pecans. I had to bake it for an hour or a little more until a tooth pick came out clean. It was so moist and very flavorful. Great recipe!! 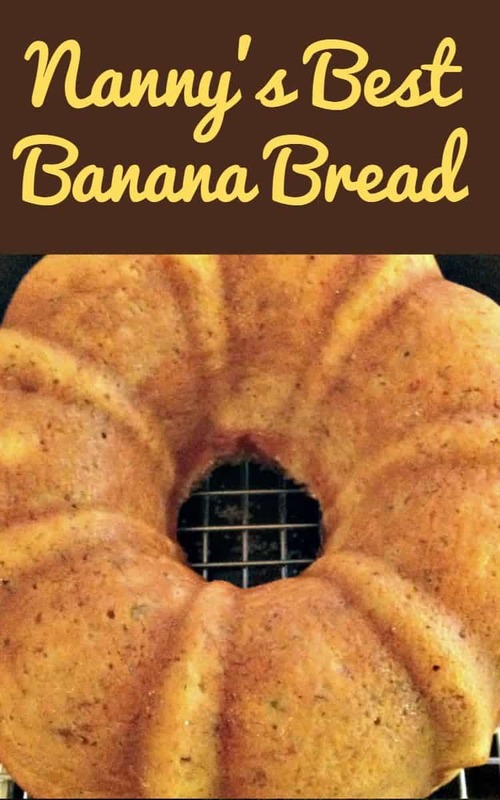 I tried the best banana bread recipe in the bundt and it was great, the only change I made was to add a teaspoon of vanilla extract at the end before baking and kept the glaze off. 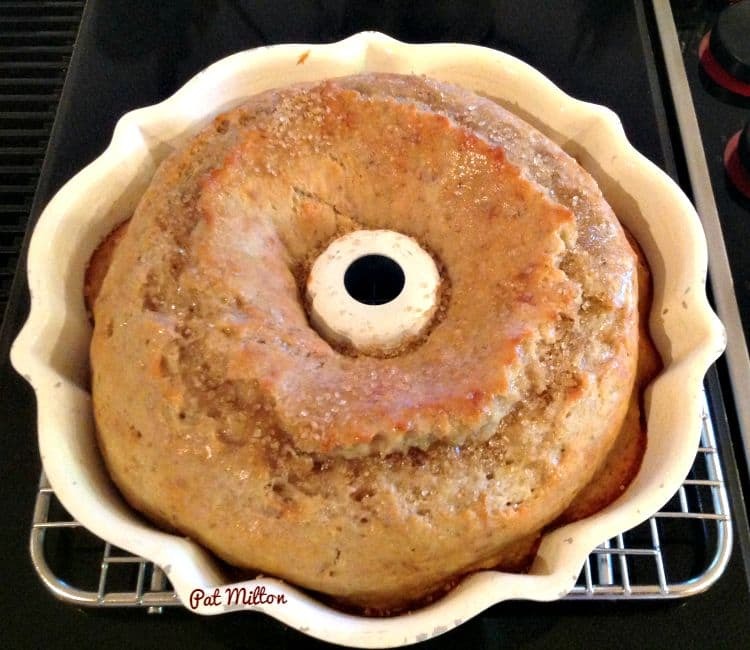 Nanny’s Best Banana (Bundt) Bread is crazy delish with or without the glaze! Moist, light and spongy. We love how the outside is sweet and sort of crunchy! Just delightful! A definite keeper and probably new go to! 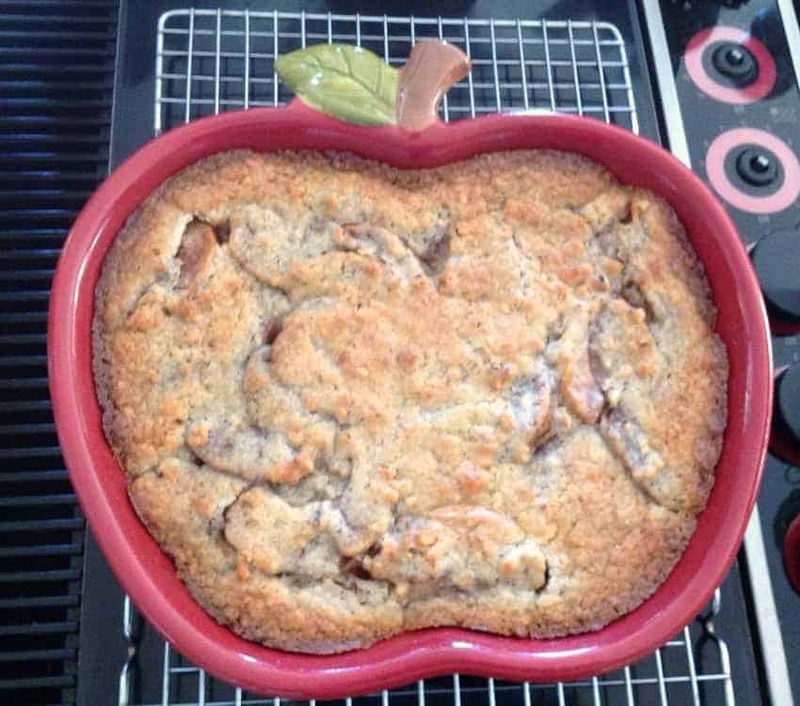 Thank you for sharing your Nanny’s recipe! Best ever banana bread. I added a cup of fresh blueberries along with the walnuts and all loved the combination. Very moist, made in Bundt pan, loaf pans and mini-loaf pans, all were outstanding. Great base for other ingredients besides the blueberries. I’ve made with chocolate chips with a great result, grandchildren loved it. I made this last night in a bundt pan however, it wasn’t done inside and fell apart when I flipped it over. I baked it for 45 Mins at 350 as the recipe indicated. Has anyone else had this problem? I ate spice which was fully baked and it was delicious, just really disappointed that it didn’t turn out. Hi Karen, I’m sorry it didn’t turn out right. I’m trying to think what could have happened because we’ve always had great feedback for this particular recipe. Sometimes, when you try to release a cake from the pan before it’s had time to cool a little and settle it can fall apart. That has happened to me in the past when I’ve baked! The cake does of course go on baking for a while after it comes out of the oven, was your cake very runny? I had this exact issue. I have a thermometer in my stove to double check temperatures because I bake a lot. After 45 minutes at 350 it wasn’t done. Did you test with a skewer or knife to make sure it’s done? Mine took a bit longer than 45 minutes. Each oven is different. I also rotate it midway. I think mine took around 55 minutes. This is by far the best banana bread. It was very moist. Tried this recipe today, best banana bread I’ve ever made. Big hit, thanks for sharing the recipe! I have made this Banana Bread Bunt cake 4 times already and have yet to hear a complaint by anyone! It reminds me of my Grandma’s banana bread and I have not had that in years! I’m so happy I came along this recipe and will be apart of our Family for years to come! I give this recipe a thumbs up!! Hey Cristina, sorry you think Nanny’s recipe is the worst ever. However, we’d appreciate constructive feedback and reasons why you think this. I am surprised because this is one of our most popular and tried recipes on the entire Lovefoodies site, perhaps if you took the time to look in the comments you will see you are very much in the minority. There is really no added value to you leaving such a comment without explaining why you think this is the worst recipe ever. I can only imagine it is because you probably didn’t follow the recipe correctly. Probably best to move on and find an even simpler recipe you might be able to follow. Good luck. This Banana bread was wonderful. It was so moist and by far the best I’ve ever ate. I tripled the recipe and gave it to people for Thanksgiving. Everyone loved it. Definitely a winner. Thanks for sharing. Amazing! So easy to make and sooo yummy! I have made it several times. It has now became the most requested recipe in my home! I have now made this about 20 times in the last 2 months.. amazing !! I add some vanilla and cinnamon and reduce to 325 since my pans are all dark coated. Than u!! That’s a great idea! I’m wondering if it fell apart because you tried to take it out of the pan before it had a chance to cool down? Sometimes that happens! This cake has become my youngest daughter’s all-time favourite; I add the walnuts but I don’t do the glaze, just dust it with icing sugar. Excellent recipe! Thank you. 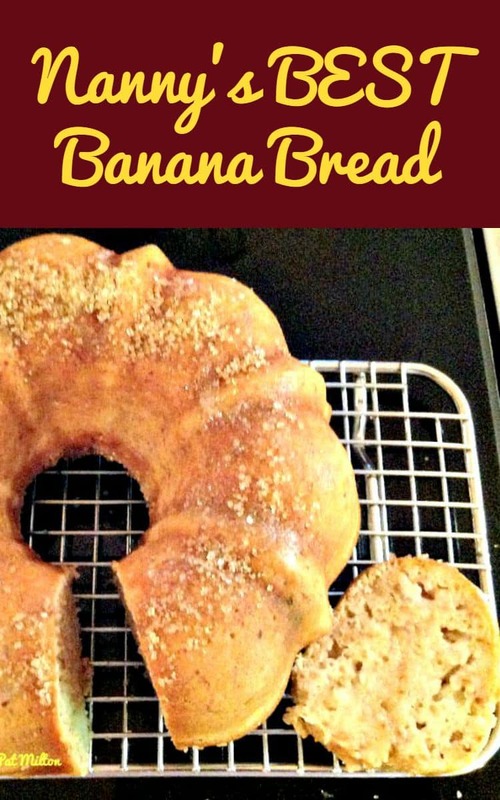 Love this banana bread, made it several times. I cut the sugar by 1/2 cup. The sweet bananas make up the difference. For the ones who claim that the glaze is too salty, check if you’re using salted butter. If yes, cut the extra salt, if not, just reduce it. As I used salted butter, I didn’t add the salt, and it was just fine. 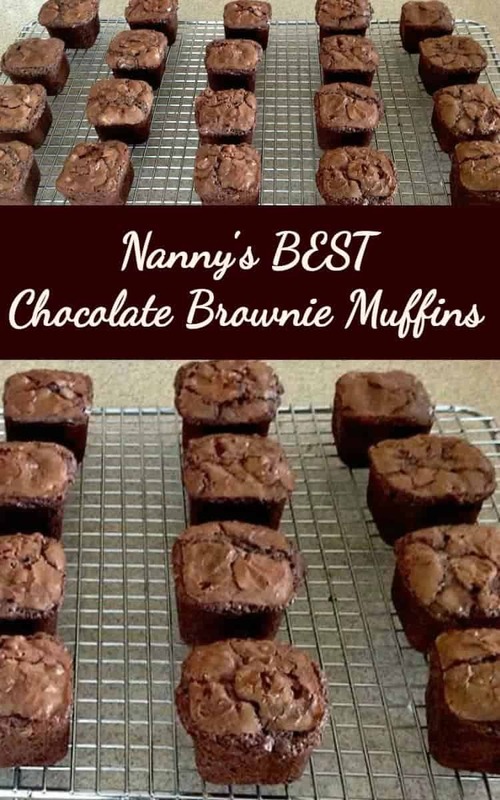 thank you this recipe i am going to make it from one nanny to another nannie my grandchildren call me that , it was my mom’s name too. Your banana bread cake is fantastic. It smells wonderful and tastes magnificent. The easiest from scratch cake I have made. The entire family loves it. My niece loves it so much I have to make her one for herself. She doesn’t like to share! This is my go-to recipe. It’s amazing. I don’t even use the glaze! It’s in the oven now! 2 loaves. Made this last night and I loved the bread part but the glaze was too salty. Excellent cake! This is now my daughter’s favourite, I have made it several times; I can’t believe how easy it is. Thank you so much for sharing this recipe, I am actually making it a second time. It is super yummy. 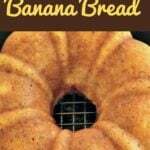 My hubby likes this banana bread/ bundt the best. So thank you again. Can’t wait to eat it! hi, i have recently made your recipe, and i was wondering if i use a dark coated bundt pan do i have to turn the temperature down to 325 in instead of setting it at 350: please let me know, thanx. Hi Leah, I don’t think it will make any difference. We haven’t had any reports of people using different colored pans, but if you are concerned, just check for done ness a little earlier than what the recipe says. The best cake I have had in a long time! AMAZING!!! I substituted chocolate chips for the nuts. My boys love it too! Do I sift the four and then measure the 2 cups or measure the 2 cups of flour and then sift it and use all of it? I’ve seen a few videos that show quite a difference in measuring after being sifted. Great with whole wheat flour!! I LOVE this recipe. Although the recipe doesn’t specify, I use brown sugar. I lower the temp to 325° and let it cookcook for almost an hour. Comes out perfect and soooo delicious! Currently making it into muffins. I can’t get enough of this recipe. So I had a bunch (literally) of bananas that ripened way quicker than I had planned for and I was looking for a recipe to use a lot of them up and required ingredients I already had in the kitchen. This recipe was perfect and so easy!!! I opted out of the glaze and instead used chocolate chips and it’s SO delicious. Exactly the banana treat I was looking for. Thank you so much for inviting me into Nanny’s kitchen!! Hi there! I baked mine (I accidentally added the sugar with the dry ingredients) and at 45 minutes the middle hadn’t cooked. I used an original bundt pan, the aluminum one. It took 110 minutes to cook through the middle, but then the outside was burned. Any remedies? Thanks for writing in and I’m sorry your cake didn’t turn out as expected. As you know, every oven behaves differently, so what I would suggest next time is to perhaps lower the temperature and bake it for longer. That should ensure it will be cooked properly in the middle and also avoid any over cooking on the outside as you described. It is unusual for anyone to have problems with this recipe as it has been made many times by our readers, so I hope you will give it another go with these suggestions and please do come back and let us know how it went! Thanks once again, we appreciate you taking the time to let us know. question: your ingredient list says baking soda but in your instructions you refer to baking powder. Which one does the recipe call for? baking soda or baking powder? Hi Shana, apologies for the confusion. It was a typing error and should read baking SODA. I have corrected it on the recipe now. Thanks so much for bringing this to my attention!